I figured now was a good time to start working on my 2009 want list so that I can keep track of all 2009 cards. I am going to put that together as new releases come out. I have never put together a want list starting at the beginning of the year so we'll see how far I actually get in doing this. My first card to look for is going to be his gold Topps #290, which I am watching on eBay but would rather trade for it since I have tons of cards here. Also, I saw some Starquest cards on eBay, and I really liked the Ultra Rare one. I'm not sure how the rest look because I haven't picked up any yet in the packs I bought but I want to work on those. 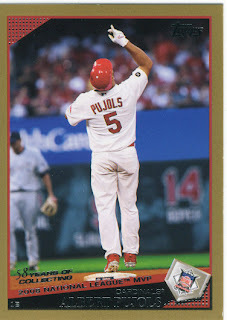 If anyone has an Pujols from this year available for trade, please let me know. P.S. I am almost done with The Card, it has taken longer than I anticipated because of the case break and laziness. I should be done with that tonight, and I'll let you know what I thought of it. All the Pujols cards that I pull in 2009 will be yours, Marie. Unless I get a 1/1 or an auto or something ridiculous like that. Hopefully there'll be some Pujols mojo when I bust my Heritage boxes in a couple weeks.